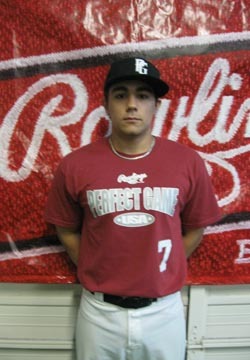 Peter Sanson is a 2010 RHP/OF with a 5'10'', 180 lb. frame from Great Falls, VA who attends Langley HS. Medium frame, some present strength. Long arm action, 3/4's release point, leg raise delivery, repeats delivery well. Consistent mid 80's fastball, will cut or run depending on what he wants, curveball showed depth and sweeping break, pounded strike zone with both pitches, good idea/mound presence and command. Good athlete with plus speed, 6.63, aggressive hitter with busy load/high leg kick that affects timing, flashes bat speed, hitting potential with calmed down approach. Tools are there.